The charters featured below are sample packages to give you an idea as to what is offered. Our yacht charter coordinators and captains are very flexible and can customize a package for your event or occasion. You will board the Adventuress at the Harbor Island Cabrillo Isle Marina (or previously arranged location) and be taken on a relaxing and enjoyable bay cruise featuring photographic points of interest such as the San Diego Skyline, Seaport Village, the Midway, and the Coronado Bay Bridge. Catering is available upon request. Up to 48 Passengers $ Affordable pricing is arranged depending on season, number of people, catering arrangements, and other factors. Request a charter and we can discuss your specific event. You will board the Adventuress at the Harbor Island Cabrillo Isle Marina and be taken out to the southern California open ocean and provided a photographic opportunity of a lifetime. The Adventuress will also host a number of other packages and charter options such as dinner cruises, weddings at sea, corporate events, sunset cruises, etc. We are very flexible and will be happy to work with you to make sure your special occasion is the best it can be. 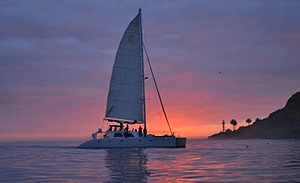 The Adventuress Catamaran is a beautifully custom built 60′ sailing yacht available exclusively for private charters in San Diego Bay and the Southern California coast. She is Coast Guard certified to accommodate up to 48 guests. 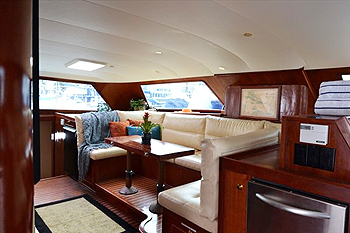 Built as a private yacht, she is appointed with a beautiful teak wood main salon, a 75 bottle wine locker, flat screen TV with satellite service, spacious outdoor decks, and a covered aft cockpit. At 60 feet in length and a generous 32 foot beam (width), the Adventuress catamaran has more deck space than most 100′ yachts. Her wide beam also makes her very stable and comfortable while at sea. The Adventuress is skippered by a US Coast Guard licensed captain while you and your guests are tended to by a professional crew to assure an amazing and memorable experience. In addition to nearly 2,000 square feet of sail area, the Adventuress also has twin 200HP turbo engines. So, whether under sail or under power, the Adventuress catamaran yacht charters can get you anywhere faster than most power boats her size. But of course, she’s also ideal for simply cruising at a leisurely pace to enjoy the sights and cool San Diego Bay breezes. Adventuress is conveniently located on Harbor Island in San Diego. However, with advanced booking, the captain and crew can rendezvous with your party at just about any waterfront property with a guest dock. Be sure to inquire at booking. San Diego Sailing Excursions – With 34 miles of scenic waterfront, sailing excursions in San Diego has so much to offer. From the rugged cliffs of Point Loma with its historic lighthouses, to the beautiful downtown San Diego city skyline and charming Seaport Village, to the Maritime Museum with one of the world’s finest collections of historic ships (including the infamous Star of India), to the elegant Coronado Bay Bridge and historic Hotel Del Coronado across from Glorietta Bay. Enjoying a San Diego sailing excursion aboard the Adventuress catamaran can be fun, exciting, educational, and relaxing all at once! 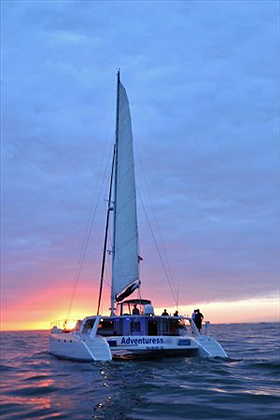 Dolphin and whale watching aboard the Adventuress catamaran. Whale Watching – San Diego’s best kept secret is the amazing year round dolphin and whale watching just off the San Diego coastline. San Diego whale watching excursions are world famous for Gray Whale watching season from December to March, and Blue Whales (the largest animal ever known to live on Earth!) can be seen from May to November. 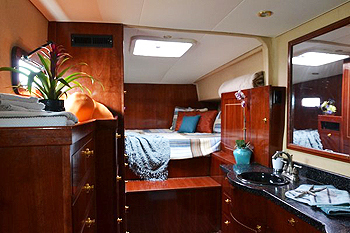 Adventuress catamaran stateroom appointed with teak wood throughout and a comfortable queen size bed. Overnight and Extended Voyages – If the sea is calling you, there is no better way to answer its call than a sailing excursion aboard the Adventuress catamaran. The Adventuress is well appointed for overnight and extended voyages with a spacious main salon and four staterooms with queen size beds, plus all the state of the art electronics and navigation equipment. With more deck space than the average 100′ yacht, you and your guests will have more than enough room, inside and out, to relax and enjoy the sailing experience. The four staterooms can comfortably accommodate up to 3 couples in addition to the captain and crew). Romance on the Bay – One of the great romances of history is human’s love affair with the sea. If the allure of sailing is calling you, then enjoy the luxury and splendor of the Adventuress for a few hours or a few days. Our sunset dinner cruise on San Diego Bay is among some of our clients favorites. You and your loved one(s) can enjoy a glass of wine or champagne while you relax on one of the over sized bean bags or deck chairs on the forward deck to watch sunset cruises San Diego, and then enjoy a private and elegant meal at the covered aft deck. The generous indoor/outdoor space allows you to enjoy our bay cruises of the San Diego bay and skyline while being outside with its gorgeous views. If you prefer to remain inside, the comfortable and cozy main salon with leather seats and panoramic windows is just the place for you. The Adventuress is a romantic yacht and ideal for sunset cruises, romantic weekend getaways, engagement parties, rehearsal dinners, bachelor/bachelorette parties, marriage proposals, intimate weddings and receptions. All charters aboard this gorgeous yacht will be customized to meet your needs, so you and your loved one will leave with the memories of a lifetime. 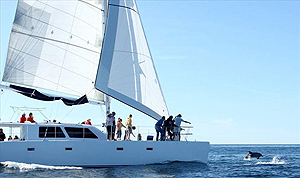 Adventuress is a great yacht for corporate team building events. Corporate Events and Team Building – Incorporate a slice of paradise into your next corporate event and impress your clients/employees with the luxury and elegance of the Adventuress catamaran. 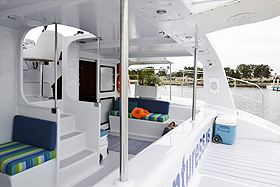 Whether you prefer a dockside reception or a sunset sail, the intimate interior and spacious exterior of this catamaran makes for an ideal venue as an executive retreat or hospitality suite. Every Team Building activity is tailored to meet your goals and to create a dynamic and personalized event. The foundation of every team building activity is centered on having fun and developing mutual respect, understanding, and communication. This camaraderie created outside the workplace has proven to create a more unified and productive workforce. 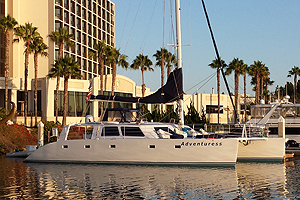 A San Diego yacht charter aboard the Adventuress catamaran has your corporate needs covered! 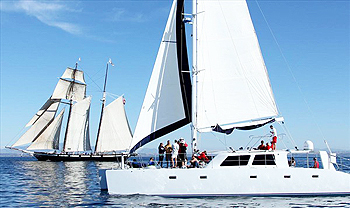 The Adventuress allows guests to enjoy both fun and creative team building activities in San Diego as wells as an intimate and comfortable environment on board a luxury catamaran to relax, socialize and network. Complete access to all sides of the yacht for the best photo opportunities and enjoying cool sea breezes and basking in the warm San Diego sun. On board heads (bathroom) with fresh water sinks. Beautiful interior salon, perfect for casual socializing, romantic dinners, or meetings. Spacious covered aft cockpit suitable for dining and/or socializing. 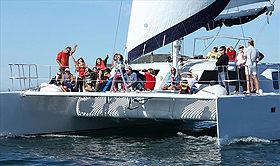 Business, romance, or fun family outing, the Adventuress catamaran is a perfect way to spend a beautiful San Diego day.